John K. Lehman: minister of the Mayton Mennonite church at Mayton, Alberta, and of the Salem Mennonite Church near Tofield, Alberta, was born near Wakarusa, Indiana, on 23 July 1874 and died on 5 November 1933 near Tofield, Alberta. He married Susanna Wideman (3 September 1876-16 October 1932) on 9 February 1898. They were the parents of five sons and three daughters. John K. Lehman's mother died when he was a small boy and he was taken to St. Jacobs, Ontario and adopted by the Joseph S. Martin family. He was baptized and joined the Mennonite Church in 1894. Three years later he joined others in a migration to May City, Iowa, where members of the Stauffer branch of the Mennonite Church had settled. He applied for membership in that church, but was denied because he had a light-weight one-horse wagon which he refused to give up even though the leaders of the local church had decreed that such vehicles were "worldly" and showed evidence of inappropriate pride. In 1901, the Lehmans, together with five or six other Mennonite families from May City, Iowa, migrated to an unsettled part of what became the Province of Alberta. There they established the hamlets of Mayton and May City. A new congregation was organized late in 1901 and John Lehman became one of the founding members. His wife, who had not been baptized, became one of the congregation's first baptismal candidates. 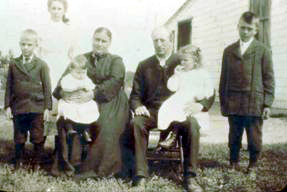 The following year members of the Amos Bauman family also moved from May City to Mayton. Amos Bauman had been ordained a minister in May City and was a brother of the Bishop who had refused Lehman membership in the church there. At Mayton the Lehman's and the Baumans became neighbors, but relations were sometimes strained. Amos Bauman was ordained as bishop in 1903, but in 1906 he wrote several controversial articles which resulted in his removal from office. John K. Lehman was then ordained (21 October 1906) as the minister of the Mayton Mennonite Church. The community, however, suffered considerable financial hardship, due mainly to transportation difficulties and destructive hail storms. For the Lehman's, Susanna's illness added to the difficulty, and in 1915 they decided to move to Oregon. They remained there for two years, returning to Mayton in 1917. But in 1918 a number of the Mayton families relocated as a group to the Tofield district where they became members, and John K. Lehman a minister in the Salem congregation. He was a sincere and devout Christian, but one who suffered misfortune, particularly in material matters, throughout his life. He died of congestive heart failure and is buried in the Salem cemetery. Stauffer, Ezra. History of the Alberta-Saskatchewan Mennonite Conference. Ryley, Alberta: Alberta-Saskatchewan Mennonite Conference, 1960: 74. Obituary for John K. Lehman in Gospel Herald (30 November 1933). Regehr, Ted D. "Lehman, John K. (1874-1933)." Global Anabaptist Mennonite Encyclopedia Online. December 2003. Web. 24 Apr 2019. http://gameo.org/index.php?title=Lehman,_John_K._(1874-1933)&oldid=143222. Regehr, Ted D. (December 2003). Lehman, John K. (1874-1933). Global Anabaptist Mennonite Encyclopedia Online. Retrieved 24 April 2019, from http://gameo.org/index.php?title=Lehman,_John_K._(1874-1933)&oldid=143222.